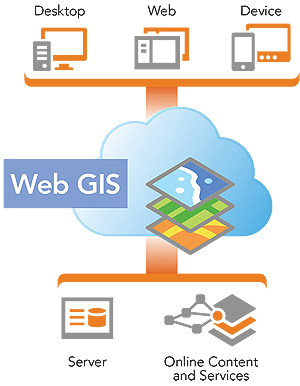 Web GIS is the best way for GIS professionals to share ArcGIS for Desktop work with non-GIS users. With web GIS, ArcGIS for Desktop users can share maps on consumer devices, like smartphones and tablets. Get apps and templates with online subscriptions. Desktop users have easy access to ArcGIS Online tools, such as geocoding and network analysis services. Every ArcGIS for Desktop user can now publish maps, tools, and data to ArcGIS Online and turn desktop GIS into a web GIS. You may be thinking to yourself, I work on the desktop; does web GIS do anything for me? The answer is yes. ArcGIS for Desktop is the premier application for authoring authoritative content and includes many tools for conducting spatial analysis and generating useful information products. ArcGIS Online provides desktop users with a wealth of maps, data, and services to supplement their own content and speed up their projects. Turning a desktop GIS into a web GIS is the best way to share work with non-GIS users. To help you get started, every Esri customer that had ArcGIS for Desktop received one ArcGIS Online subscription at no additional cost earlier this year. For each ArcGIS for Desktop license that's current on maintenance, you are now entitled to one ArcGIS Online named user and 100 service credits each time you renew (see what a service credit is worth at esri.com/agolcredits). Desktop users can tap into ArcGIS Online ready-to-use map services. This web GIS implementation of the ArcGIS platform enables you to quickly organize all your content and users and easily share your work. It also gives you access to all the additional productivity apps, such as Collector for ArcGIS, Operations Dashboard for ArcGIS, Esri Maps for Office, Esri Maps for SharePoint, and web application templates in ArcGIS Online. Collector for ArcGIS is a native, configurable app for iOS and Android devices. This app enables fast, straightforward field data collection on smartphones and tablets. Operations Dashboard brings together a common view of systems and resources you manage, and you can monitor real-time data feeds for large-scale events or day-to-day operations. Web app templates in ArcGIS Online, such as story maps, allow you to quickly build useful and attractive maps and other information products that you can easily share and that are tailored to your organization's needs without writing any code. Desktop users can share their content and tools through ArcGIS Online. As a GIS professional, you play a critical role as a curator of content. In this role, you understand how to organize, manage, and share geographic data with your organization and beyond. You are accustomed to creating and managing your own authoritative data. ArcGIS makes it easier to organize and share that data with the rest of your organization. In addition to improving your capabilities with your own data, Esri also provides you with ready-to-use content and services that augment your internal offerings via ArcGIS Online. When you need up-to-date information at your fingertips, sometimes you find that you don't have what you need to answer basic questions. For example, drive-time analysis requires current street data and a network dataset. In the case of a natural disaster, you may need updated satellite imagery. When trying to decide where a new facility should be located, you need current demographic information. This kind of information is now provided through the ArcGIS platform. Web GIS supports apps on any device. ArcGIS comes with an amazing collection of authoritative, best-of-breed content. This includes a suite of basemaps with varying levels of cartographic detail; a diverse collection of imagery; demographic and lifestyle maps; real-time traffic and weather; and scientific maps that look at things like land use, terrain, and soils. Web GIS is the best way for GIS professionals to share ArcGIS for Desktop work with non-GIS users. People are eager to use maps but are not necessarily ArcGIS for Desktop experts. In fact, people expect to be able to find and use maps right from their own consumer devices, like a smartphone or tablet. People also expect to be able to take maps and use them as a starting point for their own creations and purpose. 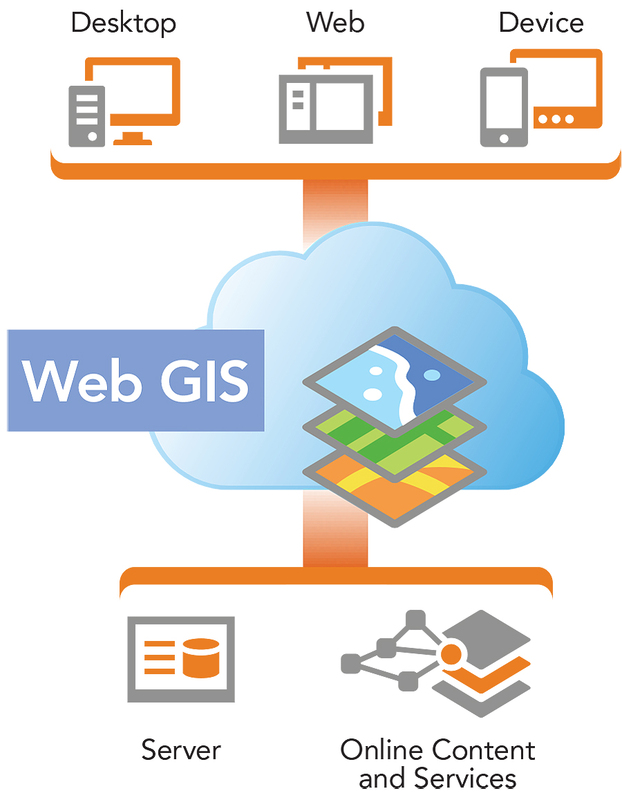 Web GIS enables all this, and now as an ArcGIS for Desktop user, you have the ability to take the lead in your organization. You have the power to create interesting and useful content, tell amazing and compelling stories, and share those stories in informative and novel ways. To learn more, visit esri.com/webgis.